Currently running at MoMA till March 21, 2011 are Andy Warhol’s black and white silent films, both daring and experimental in their subject and theme. Although these films were originally shot at sound-film speed (twenty-four frames per second), Warhol specified that prints be projected at a slower speed of sixteen frames per second, a rate used in the projection of silent films from the 1890s through the 1920s. Kiss 1963–64. 16mm film (black and white, silent). 54 min. at 16fps. © 2010 The Andy Warhol Museum, Pittsburgh, PA, a museum of Carnegie Institute. For this exhibition, a selection of Warhol’s films made between 1963 and 1966 has been transferred from 16mm film to DVD at the speed of sixteen frames per second, and projected onto screens and monitors in a gallery setting. This makes it possible to see the works as Warhol intended, and to appreciate the ways in which he challenged and provoked both subject and viewer in his manipulation of moving images. 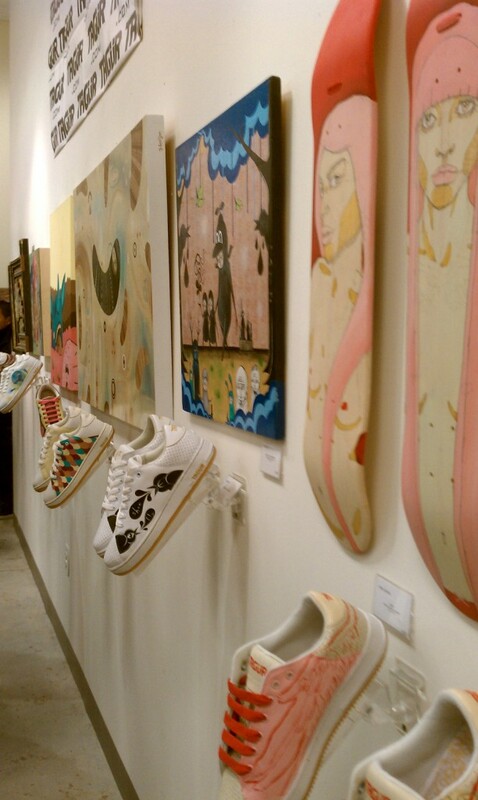 Saturday night, December 18th, was the opening of Inked Souls 3, a customized sneaker and fine art show located at Art Whino Gallery. In collaboration with Tagür, the event showcased the art of individual customization. Each invited artist was given a pair of blank AKA Tagür sneakers and asked to design them with their own unique style and perspective. The range of artist expression runs the gamut from urban graffiti art to traditional oil on canvas, and from figurative interpretations to the abstract. These sneakers aren’t just for show, some of these beauties will be chosen for mass production (through voting) and sold at Finishline retailers and Footaction stores nationwide. The DJ was spinning Kanye West’s “Power” when we first entered the packed gallery which immediately set the tone for a hip atmosphere. Even though the space was overflowing with people, there was still ample room to view the showcase. 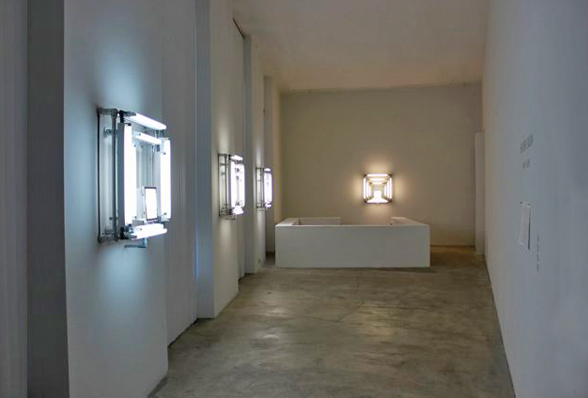 Heather Carson LIGHT ACTION: light/ALBERS Exhibition at Ace Gallery has been extended till January 2011. Heath Carson‘s formal and conceptual investigations into the properties of light draw together the historic strands of East Coast Minimalism and West Coast Light and Space. Throughout her international career as a lighting designer for thirty years in theatre, opera, video, dance and concert – Carson has wielded light in a muscular fashion exploring its color temperatures and physical properties. Experience an adventure through time and space in this animated short film ‘Helios’ by Juan Behrens. During the 17th century, the Roman Catholic church believed that the earth was the center of the universe and people who tried to prove them wrong were in danger of being accused of heresy. Helios is the story of how an idea found his innovator, triggering a series of consequences in time. The date is 1609, Italy, late night at Galileo Galilei’s workplace watching the sky, studying celestial bodies focusing on the moon. He prepares to see this unexplored world with his customized telescope while some of his sketches and notes rest on the floor. After a gentle approach to the telescope, he sees the moon through it, a celestial body full of enigmas and intriguing for any human eye. After a moment, a bright light invades his scene but he does not notice it. This light resembles the silhouette of the invention, this enigmatic form splits into three muses. These three muses approach Galileo and start touching his back, rest next to him and point to the sky. Galileo start watching the moon different, he start spotting data out from the moon he did not see before, now he seems to understand how the moon works and why. He draws what he sees, prepares himself to present this to the cardinal Bellarmine at the church proving that the earth is not the center of the universe but orbits around the sun just like the moon around the earth. Galileo’s discovery fundamentally alters the way humans perceive themselves in the cosmos. Visually, the scene transition to schematic graphs that represent each belief, they merge and present a montage of the inventions that resulted from this epiphany. Someone has a great sense of humor in Griffin, Georgia. 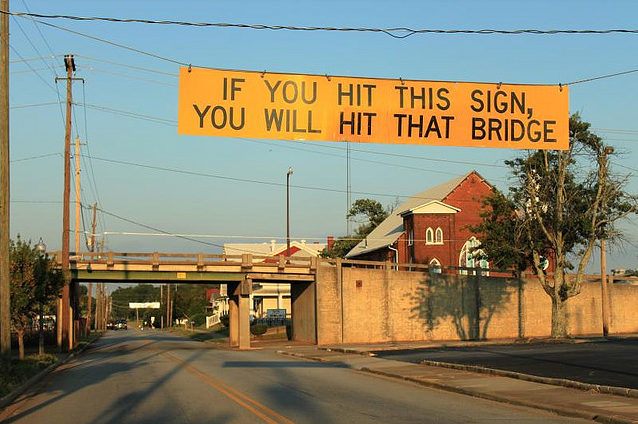 To come up with If You Hit This Sign, You Will Hit That Bridge sign, they must work in advertising, cause this is the way to make someone pay attention. Photo courtesy of Under Exposure. 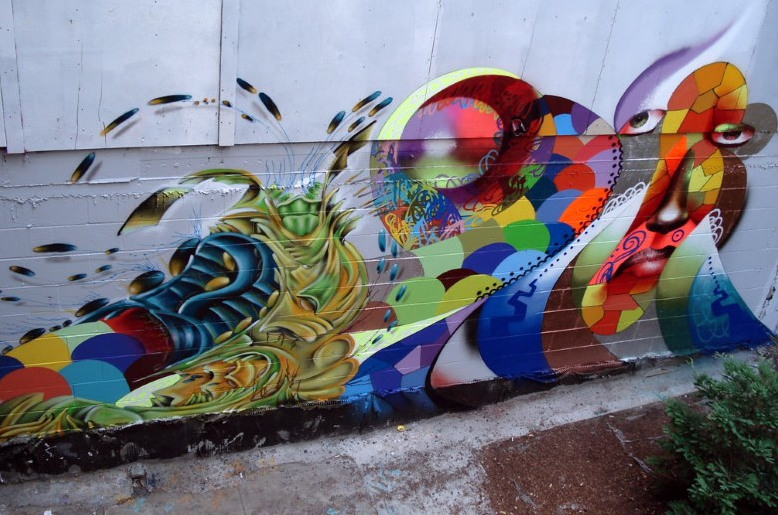 Urban graffiti artist Erhman has been painting for over 14 years. Through graffiti, Eon75 have traveled and created murals all throughout Europe and North America. Erhamn has presented canvas work in 4 different countries and has personally organized three art shows in Naples, Florida with the Journeyman Gallery. His canvases have been collected world wide from North America to Europe and Asia.